More transparency we can believe in! In a 6-5 ruling issued this afternoon, the 9th Circuit Court of Appeals handed the Obama administration a major victory in its efforts to shield Bush crimes from judicial review, when the court upheld the Obama DOJ’s argument that Bush’s rendition program, used to send victims to be tortured, are “state secrets” and its legality thus cannot be adjudicated by courts. 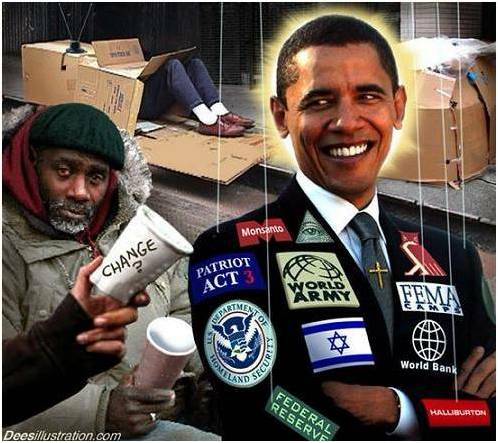 The Obama DOJ had appealed to the full 9th Circuit from last year’s ruling by a 3-judge panel which rejected the “state secrets” argument and held that it cannot be used as a weapon to shield the Executive Branch from allegations in this case that it broke the law. I’ve written multiple times about this case, brought by torture/rendition victim Binyam Mohamed and several others against the Boeing subsidiary which, at the behest of the Bush administration, rendered them to be tortured. “The ruling handed a major victory to the Obama administration in its effort to advance a sweeping view of executive secrecy power.” That says it all. Salon‘s Glenn Greenwald wrote that the move “demonstrates that the Obama DOJ plans to invoke the exact radical doctrines of executive secrecy which Bush used.” MSNBC’s Keith Olbermann called it “deja vu all over again”. Suffice to say — with great understatement — Obama’s doing this doesn’t trigger the same level of outrage and objection as when Bush did it, at least not in most circles. And I do so fondly recall the days back in the Spring of last year when civil libertarians who were vigorously objecting to Obama’s Bush-replicating legal positions were told by vocal Obama supporters that Obama was only doing this in order to ensure that Bush’s extremist legal theories were rejected by courts and thus we were all generously showered with the Magnanimous Gift of Good Precedent. Again with great understatement, Obama’s appealing the 9th Circuit’s rejection of the Bush/Obama “state secrets” argument to the full court — and thus securing one of the most harmful judicial endorsements ever of this radical secrecy doctrine — is not exactly consistent with that Obama-justifying rationale. Are you feeling enthused to go vote? If not, just close your eyes and think “SARAH PALIN,” and all of this will blissfully disappear. Besides, the President got really animated in his speech on Monday, so that’s important. The decision bolstered an array of ways in which the Obama administration has pressed forward with broad counter-terrorism policies after taking over from the Bush team, a degree of continuity that has departed from the expectations fostered by President Obama’s campaign rhetoric, which was often sharply critical of President Bush’s approach. Among other policies, the Obama team has also placed a United States citizen on a targeted-killings list without a trial, blocked efforts by detainees in Afghanistan to bring habeas-corpus lawsuits challenging their indefinite imprisonment, and continued the C.I.A. rendition program . . . .
As a senator and candidate for the White House, President Obama had criticized the Bush administration’s frequent use of the state-secrets privilege. In February 2009, when his weeks-old administration reaffirmed the Bush administration’s view on the case, civil libertarian groups that had supported his campaign expressed shock and dismay. That, too, is superb under-statement: Obama’s continuity of Bush’s Terrorism policies “has departed from the expectations fostered by President Obama’s campaign rhetoric.” Yes, one could say that. 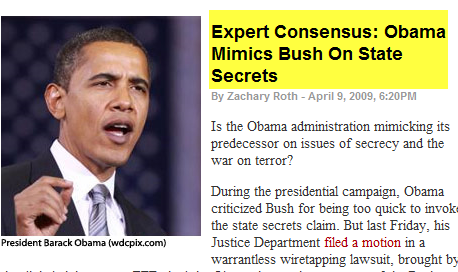 Just to give a sense for how far we’ve traveled, how low we’ve fallen, here’s what The New York Times‘ John Schwartz reported in February, 2009, when the Obama DOJ first told the 9th Circuit that they were going to assert the same “state secrets” arguments in this case which the Bush DOJ made: “In a closely watched case involving rendition and torture, a lawyer for the Obama administration seemed to surprise a panel of federal appeals judges on Monday by pressing ahead with an argument for preserving state secrets originally developed by the Bush administration.” Schwartz described how the judges on the appellate panel were so startled that they actually asked multiple times if the Obama DOJ was really sticking with the Bush position, as though they couldn’t believe what they were hearing. What a quaint time that was, when people were surprised by Obama’s replicating Bush’s secrecy and Terrorism positions — the very ones he so vehemently condemned when running for President. After 18 months of seeing this over and over in multiple realms, nobody would react that way now. UPDATE II: The New York Times has a quite good Editorial on this matter this morning — headlined: “Torture Is a Crime, Not a Secret” — and explains: “Barack Obama told voters in 2008 that he opposed the government cult of secrecy, but once he became president, his Justice Department also argued that the case should be dismissed on secrecy grounds.” The history of America’s torture regime will record not only the criminality and shamefulness of the torture itself, but also the subsequent — and ongoing — effort by the U.S. Government to prevent its victims from obtaining any justice while protecting the perpetrators from all accountability.